The promoters of Saturday's March For Our Lives claimed that 800,000 attended the DC event. No one believes that — except USA Today, which was clinging to that inflated figure Sunday afternoon, well after more sober observers estimated a 75 percent smaller turnout. More than 200,000 people attended the March for Our Lives demonstration in Washington D.C. on Saturday, according to Digital Design & Imaging Service Inc (DDIS). The Virginia-based firm uses a proprietary method for calculating crowd size using aerial photos. The peak crowd size was 202,796 people, with a margin of error of 15 percent, the firm said. The crowd reached its largest size at 1 p.m., according to the company's estimates. The organizers put the total number of attendees at closer to 800,000. The largest single-day demonstration in U.S. history was the 2017 Women's March, with a crowd size of 440,000 people, according to DDIS' estimates. The estimated DC crowd of just over 200,000 makes yesterday's event at best half the size of at least two March For Life crowds seen in recent years. Fox News and others have reported that the 2013 pro-life march had 650,000 participants, while NPR reported before the 2013 march that the 2012 event had "an estimated 400,000." Despite press reluctance to concede the vastness of March For Life crowds during the past few years, time-lapse videos from the 2017 and 2018 marches show that the event continues to draw hundreds of thousands. About 800,000 descended on the nation's capital, exceeding expectations including many from Parkland. March For Our Lives organizers estimate 800,000 protesters attended the gun-control demonstration in Washington, D.C., on Saturday. If they're correct, the event would be the largest single-day protest in the history of the nation's capital. The total is bigger than the inaugural Women's March, which brought 500,000 to D.C., according to the Washington Post. Additionally, a video caption at a Sunday afternoon "What's next?" USA Today story updated at 4:03 p.m. still reads: "More than 1 million people are expected to attend the March for Our Lives in Washington D.C. ..."
USA Today's reporters misinterpreted the Washington Post's "in U.S. history" claim, which focused on all-location nationwide or worldwide attendance. 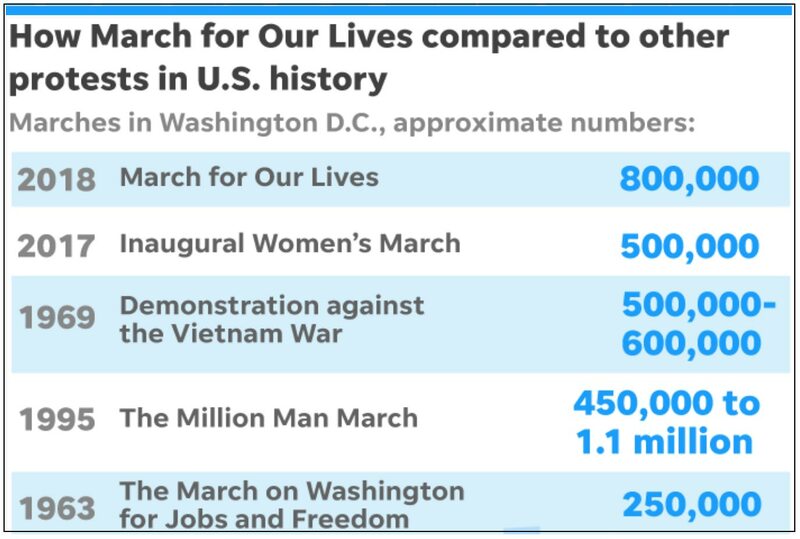 The 440,000 Women's March estimate reported above by CBS News should really put it in third place on USA Today's list behind 1969's "Moratorium Day" demonstration against the Vietnam War — and all of this ignores several Marches for Life which obviously belong on the list.